This year saw the launch of the national Limbs 4 Kids program; a year where we witnessed significant successes and achievements. Program launch. Media releases and program information sent to close to 9,500 state and federal Members of Parliament, local councils, peak bodies, medical and allied health professionals, community organisations, educators and media. 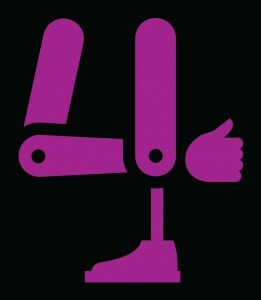 Limbs 4 Kids website. Launch of the Limbs 4 Kids website which contains 135 pages across the Learning Centre, Stories, Publications, News and Support sections. The website has had outstanding results with 4,438 unique visitors review 15,258 pages since its launch. Fact Sheets. Development of twelve Fact Sheets covering topics such as limb difference, education, funding, hygiene, self-advocacy, and transition to further education and employment. Thrive magazine. Four editions of Thrive magazine have been produced during 2015, containing a variety of articles featuring parents, young people with limb differences, adults born with limb differences, medical and allied healthcare providers, community organisations and information of relevance to the Limbs 4 Kids community. Readers of Thrive magazine total close to 3,200 individuals and organisations across Australia. Peer Support. Phone calls and visits provided to 61 families of children with limb differences by our Parent Peer Support Volunteers. Enquiries. Just over 310 enquiries requesting information, support and advice have been provided to families, healthcare professionals and community members. Research. Monash University has conducted a baseline evaluation of the Limbs 4 Kids program and enquiry as to the health and wellbeing of parents / carers of children with limb difference. This evaluation has been conducted with 42 participants and in 2016 participants will be provided with an opportunity to participate in interviews with the researchers. Strategic Partnerships. Partnerships and relationships have been established with a range of Australian and international peak bodies, prosthetic providers, hospitals, medical and allied healthcare facilities and community organisations. National Health and Wellbeing Advisory Committee (NHWAC). The NHWAC is comprised of an array of medical and allied health professionals (Gynaecologist and Obstetrician, Rehabilitation Consultant, nurses, hospital executive, paediatric physiotherapist, prosthetist, social worker), parents of children with limb differences, adults born with a limb difference and amputees. This Committee has a particular responsibility to provide Limbs 4 Kids program oversight, review of program resources, identify gaps in information and servicing, and assist in building program linkages. Stakeholder growth. Over the course of the year Limbs 4 Kids has seen an exponential growth in subscribers to our publications and resources. Since January the number of families subscribing has increased by 89% and the number of healthcare professionals by 28%. Australian reach. Limbs 4 Kids has visited five states during the year; meeting with healthcare professionals, community organisations and families during these meetings. Speech in the Australian House of Representatives. The Hon. Warren Entsch MP (Federal Member for Leichhardt) gave a 90 second speech about the Limbs 4 Kids program in June 2015, and referenced that his grand-daughter was born with a congenital arm limb difference. We would like to extend our gratitude to nib foundation for their funding of Limbs 4 Kids and their commitment to supporting children with limb differences and their families. We would also like to thank every person, family, professional and community member that made the first year of Limbs 4 Kids such a success. We look forward to working with you all and expanding the program even further in 2016.